January 8, 2014 - For only the second time since the first National Baseball Hall of Fame class in 1936, the Baseball Writers’ Association of America elected three players in their first year of eligibility to the Hall of Fame in balloting verified by Ernst & Young. Pitchers Greg Maddux and Tom Glavine and designated hitter-first baseman Frank Thomas all cleared the 75-percent plurality threshold to gain election to the Hall of Fame and will be inducted in ceremonies July 25-28 at Cooperstown, N.Y.
Maddux was the leading vote getter with 555 votes of the 571 ballots, including one blank, cast by senior members of the BBWAA, writers with 10 or more consecutive years of service. That represented 97.2 percent of the vote. Glavine received 525 votes (91.9 percent) and Thomas 478 (83.7). It marked the first time that three first-ballot nominees were elected since Nolan Ryan, George Brett and Robin Yount in 1999. Craig Biggio missed the 75-percent cutoff point of 429 by two votes, tying Nellie Fox in 1985 and Pie Traynor in 1947 for the smallest margin in balloting history. Traynor was elected in 1948. Fox was in his last year on the ballot and was subsequently elected by the Veterans Committee in 1997. It was Biggio’s second year on the ballot. Players may remain on the ballot for up to 15 years provided they receive five percent of the vote. Pitcher Jack Morris received 351 votes (61.5) in his final year on the ballot and will be eligible for the Expansion Era Committee consideration in the fall of 2016. Players receiving sufficient support to remain on the BBWAA ballot were first baseman Jeff Bagwell (54.3), outfielder Tim Raines (46.1), pitcher Roger Clemens (35.4), outfielder Barry Bonds (34.7), relief pitcher Lee Smith (29.9), pitcher Curt Schilling (29.2), designated hitter-third baseman Edgar Martinez (25.2), shortstop Alan Trammell (20.8), pitcher Mike Mussina (20.3), second baseman Jeff Kent (15.2), first baseman Fred McGriff (11.7), first baseman Mark McGwire (11.0), outfielder Larry Walker (10.2), first baseman Don Mattingly (8.2) and outfielder Sammy Sosa (7.2). Maddux and Glavine are the first pair of Hall of Fame classmates both to record voting percentages in the 90th-percentile since 2007 with Cal Ripken Jr. (98.5) and Tony Gwynn (97.6). Overall it is the fifth time in Hall of Fame voting history that classmates have recorded 90th-percentile totals, joining 1936 (Ty Cobb 98.2 Honus Wagner 95.1, Babe Ruth 95.1, Christy Mathewson 90.7); 1989 (Johnny Bench 96.4, Carl Yastrzemski 94.6); 1999 (Ryan – 98.8, Brett – 98.29) and 2007. Thomas is the first Hall of Famer to have played a majority of games at the DH position. He appeared in 2,322 career games, with 1,310 coming as a DH, (56.4%). Paul Molitor, who was elected in 2004, played 44 percent of his games as a DH. Maddux and Glavine are the first pair of 300-game winners elected in the same year since 1973 – Warren Spahn (363) and Mickey Welch (307). The only other time two 300-game winners were elected in the same year was in 1936 when the BBWAA chose Walter Johnson (417) and Christy Mathewson (373). 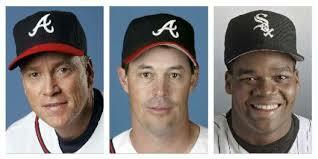 Maddux and Glavine are the first pair of living 300-game winners elected to the Hall of Fame in the same year. The election of Maddux and Glavine marks the first time since 1992 that two former big league starting pitchers entered the Hall in the same class. That year Tom Seaver was elected by the BBWAA and Hal Newhouser by the Veterans Committee. The last time two former big league starting pitchers were elected in the same year by the BBWAA was 1991 – Ferguson Jenkins and Gaylord Perry. Jenkins and Perry were also prior members of the same rotation to be elected together, having pitched albeit for only part of each season with the Texas Rangers in 1975 and 1980. The last time two big league starters that pitched at least one whole season in the same rotation were elected to the Hall of Fame was 1946; Jack Chesbro and Rube Waddell took regular turns in the Pittsburgh Pirates rotation in 1900. Another member of the Class of 1946, Eddie Plank, was in the Philadelphia Athletics rotation with Waddell from 1902-07.